It is sad to admit that unfortunately there are just some places you can’t bring a dog, your honeymoon, the hospital, on a business trip or just to relax on family vacation. There are also times when it is more convenient to have your dog not at home because of events that may be stressful to them such as an evening with friends, fireworks on a holiday, an overnight party for your kids or renovations around the house. It’s helpful to have a place you trust in your back pocket when you have to separate from your canine companion. And the worst time to look for that place is at the last minute. Even before you become a dog owner you should begin thinking about contingency planning in case you have to be away. Early in your life as a pet parent, you should look into visiting dog day care facilities and/or boarding kennels in your area so you can make an informed choice without a hurried need. If you wait until the last minute, the place you have to choose may be full, or may be a bad choice for your dog’s needs. When I was ten my parents suddenly had an opportunity to go to Europe for the summer. Relying on word of mouth alone, without a previous site visit, they packed me off to a summer camp, said a cheery goodbye and departed for 8 weeks. I’ve never forgotten how lonely and betrayed I felt in that strange place. Dogs, too, can get lonely and depressed. With today’s options there is no reason to cause your dog undue stress. This is one reason you want to start visiting places in advance. 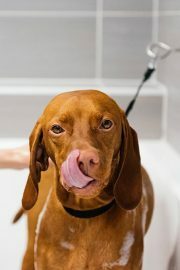 Trust your nose when you are visiting a potential dog daycare or boarding facility. The best facilities have special ventilation systems that lessen the aroma of too much dog. And while you are at it, make sure that the entire place is clean and orderly. 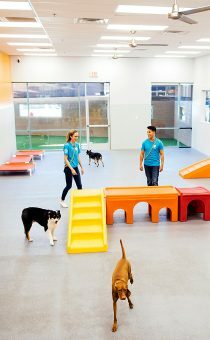 Dogtopia gives facility tours, so you can make a visit prior to when you are planning to leave your dog. If a facility is hesitant about giving you a tour or if the tour seems to omit areas other than the actual play group with dogs in open play, then this is a warning sign. 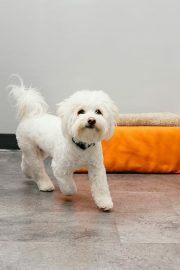 To assist pet parents in transparency, Dogtopia facilities are also equipped with web cameras so you can see your dog whenever they are in open play. Look at the climate control of facilities as dog businesses should have adequate temperature controls indoors to combat extreme heat or cold weather. All responsible boarding and dog day care providers will ask you about your dog’s vaccinations and will require proof of certain shots. On the tour, make sure you can see how and where your dog will sleep. Dogs are den animals and prefer “safe” space so open sleep arrangements often do not permit your furry family to fully rest. 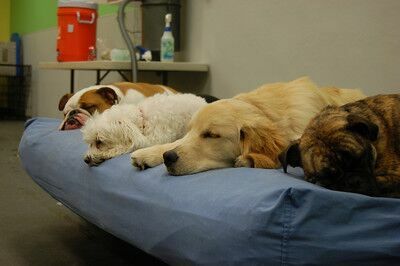 When dogs are not rested, just like kids the day after a slumber party, they can become grumpy and clumsy leading to injuries so having a contained, safe space for your dog to rest while boarding is essential. The more familiar the place you choose to board your dog, the less stressful it will be. This is why you should always attempt to bring your dog to visit and play prior to a stay whenever possible. 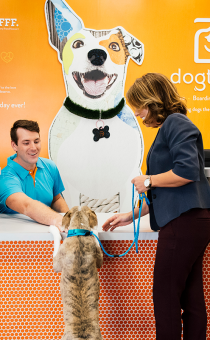 Since dog’s process time very differently, dropping them off and picking them up for a few days of play at different points prior to a stay will greatly lessen your dog from stressing once the boarding stay begins. Not only does it help them become familiar with the place and team there, it shows them that my parent drops me off and my parent picks me up. It also helps the team get to know what is your family member’s “normal” behavior looks like so if they do become stressed, they can better identify that during the stay. Other items to help your dog have a stress free stay include bringing something familiar for bedtime such as regular bed, a shirt that smells like you and you always want to bring their regular food. Dogtopia always provides house food at no extra charge but it is especially important to maintain their regular diet on a boarding stay. While it is ok to feel sad and mopey when you leave your beloved family, doing so can cause your dog to sense your discomfort and become upset. Keep the goodbyes short and sweet just like any other fun day at daycare and you can come back to find that your dog enjoyed his “vacation” just as much as you did! 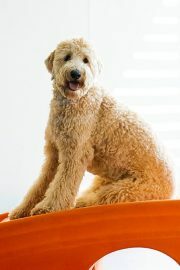 Learn more about Dogtopia’s boarding services in Mississauga, Calgary and Coquitlam.